death, while indicating their gender and nationality. 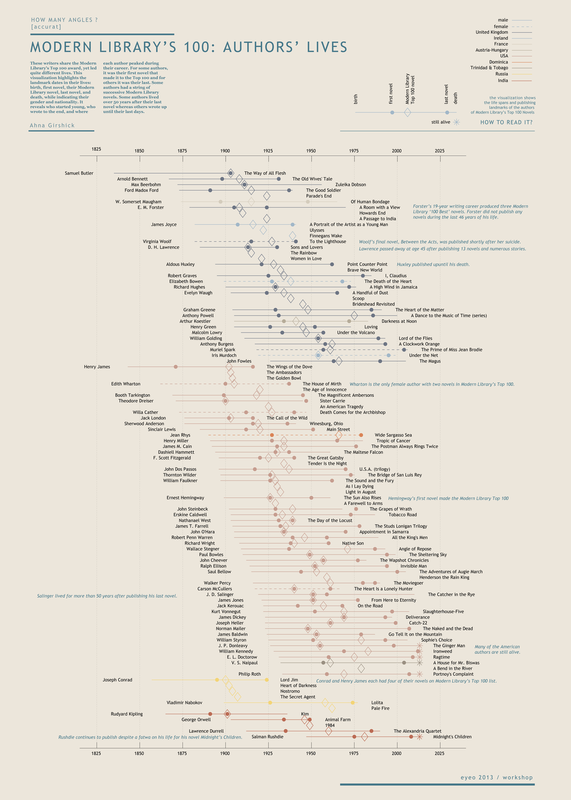 It reveals who started young, who wrote to the end, and where each author peaked during their career. For some authors, it was their first novel that made it to the Top 100 and for others it was their last. Some authors had a string of successive Modern Library novels. Some authors lived over 50 years after their last novel whereas others wrote up until their last days. E.M. Forster had three novels in the Modern Library's Top 100 during his 19-year writing career, yet did not publish anything for the last 46 years of his life. Edith Wharton is the only female author with two Modern Library Top 100 awards. Ernest Hemingway's first novel made the Modern Library Top 100. Joseph Conrad and Henry James each had four novels on the Modern Library Top 100. I made this visualization with EYEO 2013 and Accurat.it as part of the How Many Angles? workshop, with the goal of adhering to the distinct Accurat design style.